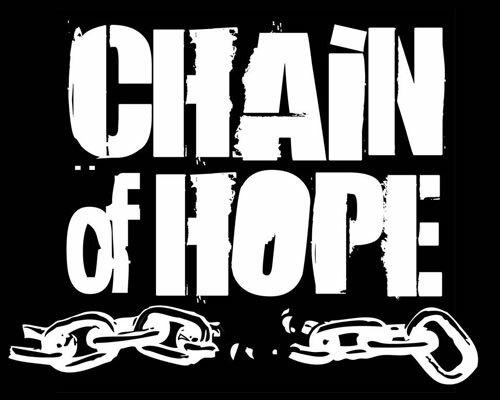 About 3 years ago, Chain of Hope rescued a poor dog that was chained up under a man’s deck in dismal circumstances: feces all over, never any food or water, broken glass all around, a broken dog house-it was disgusting. We called animal control a couple of times, but they never did anything. All we got was “unable to make contact”. We continued caring for this dog. We took him a decent dog house. The neighbor would come out when we were feeding and watering him and ask us to please get that dog out of there. He felt very sorry for the dog and told us that he never saw the man out there, ever. We kept plugging away at this situation and we were finally able to bring the dog into our program. We also removed the dog house that we had given him so that the guy would not have shelter in case he tried to get another dog. Copper was eventually adopted and here he is with his new owner, Mark. He is having a wonderful life! If you know anything about Chain of Hope, it’s that we continue to watch these houses. We would check periodically to see if he’d gotten another dog. Almost 2 yrs. went by and there was nothing there. Yes, we watched this house for 2 years. Then one day I was driving by the house and I noticed a blue barrel in the same spot under the deck where Copper had been chained. It is not unusual for people to use a barrel as a dog house. I did not see a dog, but it was almost dark and it could’ve been way back in the barrel. I also noticed an upside down bowl in the dirt. I made a note to check again in a day or two. We checked back and sure enough this guy had gotten another dog. They usually try this after awhile. This dog was a young rottie mix. He was probably between 6-12 months old. He was in terrible shape. He skin was very flaky and he was missing hair. He was underweight as well, poor guy. This is where he lived. We were able to get this dog out of here as well. No way was it going to live under the same deck in squalor like Copper had done for so long. Since we had named the first dog we rescued from here Copper, this dog was named Robbie. A little play on cops and robbers! Robbie was a wonderful boy. He had the most fantastic ears! His left one went straight up and his right one laid over. It was so adorable-made us smile everyday. We all loved this boy immediately! First, we had to get Robbie healthy. He was loaded with parasites-internal and external. We got him treated for those. He was on meds for his skin, which began clearing up. Robbie soon started putting on weight-what a handsome boy he was! We were finally able to get Robbie in for his neuter, heart worm test and vaccinations. Robbie was a very sweet and affectionate dog. To think that he always had all that love to give to someone when he was chained in the dirt makes me sad. He was having fun now at Chain of Hope. He was doing excellent in a play group and he was finally all set for adoption! We had Robbie for a couple of months and then we received an excellent application. Corey had a female rottie/shep mix named Soze. She’s a great dog and she and Robbie loved each other immediately! They are best friends and have a great yard to run and play in. Robbie’s new name is Zeke and he is doing fantastic! He is a very happy dog and we thank Corey for giving him a forever, loving home. We are tenacious, compassionate and we do not forget. Because of this, both Copper and Zeke are having great lives and not living chained up under a deck by a very uncaring owner. But still, we watch…..
Have a great life, Zeke!